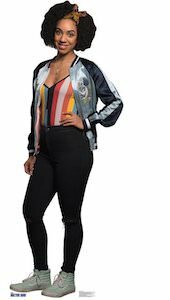 If you want Bill Potts from Doctor Who in your life then this is the next best things a lifesize cardboard poster of Bill Potts. So now your home can have a Bill Potts in it and she looks just like she did when here adventures with the 12th Doctor all started. And the cardboard version of Bill comes with an easel so that she can be a free standing character in your home or be part of your Doctor Who themed party. Now you can have Bill Potts to your side all the time, she can stand around or you can decide to hang her on the wall. Of course you have seen the 50th anniversary episode from Doctor Who and if you did then you have seen the 10th and 11th Doctor Who together just like on this cardboard cutout poster. This freestanding poster has a easel so that it can stand any where you want and as it is life-size you can feel that you are together with two versions of the Doctor. The standee shows the 11th Doctor standing in front of the the 10th Doctor and there is an active Sonic Screwdriver to. Tom Baker was probably the first Doctor Who I heard about a long time ago and he still looks to funny with his giant scarf. And now the 4th Doctor Who can be part of you life. This cardboard cutout of the Doctor is life-size (181 cm) and is of course officially licensed and looks just like the real 4th Doctor. And this Doctor Who standee poster is free standing so it can be any where and when you want the doctor to be out of the way then he just fold flat. I would not think about this any longer, you just need this Doctor Who 4th Doctor Cutout Standee. There is River Song like we all know her from her adventures in Doctor Who. And this time River Song is dresses like a cowboy ready to shoot at the Stetson cowboy hat that the 11th Doctor was wearing. This freestanding cardboard poster of River is life size so you can have a true to size version of River Song in your home ready to surprise you guests. So if River Song is one of you favorite Doctor Who characters then why not getting a full size version of her to keep your company. So get the party started and decorate with this Doctor Who River Song Cardboard Standee. Always wanted to be the companion of Doctor Who? Now you can take a photo that can make the world believe that you met the 11th Doctor. 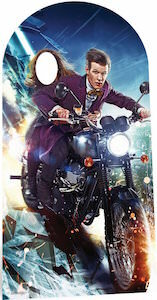 This free standing life-size cardboard poster shows the 11th Doctor on a motorcycle and on the back there is Clara Oswald. But someone cutout Clara’s face and that mean you can stand in for her and that makes it like you where on the bike with the Doctor. It would also be great if you are having a Doctor Who themed party as everyone can then hang out with a life-size version of the Doctor. So get ready to hang out with the Doctor on this Doctor Who Clara And The Doctor Stand In Cardboard Poster. Doctor number 9 is still one of my favorites and now there is a cardboard version of him and he can stand by himself with the included easel and yes he is life size. This standee of Christopher Eccleston shows him as Doctor Who wearing his famous leather jacket and pointing his Sonic Screwdriver at you. Just imagine having the Doctor around when you are doing a Doctor Who marathon. And when it’s over you can just fold his stand and put him in a closet for the next Doctor Who party. Always wanted to know what it would feel like to be the companion of Doctor Who? By getting this cardboard version of the doctor you can at least have a bit of that feeling. Come take a better look at this Cardboard Version Of The 9th Doctor Who. There we have the 12th Doctor and this life size version of Doctor Who can be yours. This is a cardboard poster of Peter Capaldi as the 12th Doctor and this poster can stand by itself making it a great gimmick for a Doctor Who party. And the Doctor is 188 cm tall making it real life size and bigger then me. You can easily assemble and fold the Doctor up so that you can put him away when you don’t want people to see him. And besides standing somewhere in the room this cardboard cut out poster of the Doctor can also be placed against a wall if you prefer. Come get your own Doctor that maybe a bit flat but still, so get your 12th Doctor Cardboard Poster. There is General Staal one of the Sontaran’s we have seen in the Doctor Who stories. And this Sontaran is a life-size cutout that can stand on it’s own and makes a great decoration piece for a Doctor Who party. This Sontaran has all the details you expect and of course there doesn’t seem to be a neck. 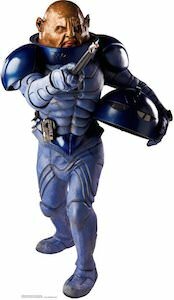 Besides having this Sontaran standee as a free standing thing you can also keep him flat so that you could place or hang it against a wall. And as you can see General Staal is ready for battle with his weapon ready. OK maybe he should be wearing his helmet instead of carrying it but besides that he is ready for battle. Come check out this Doctor Who Sontaran Cardboard Poster Of General Staal. Is you circle of friends a bit small and would love to have so real special friends that don’t talk to much? How about the 11th Doctor and Amy Pond? Now you can have a life size cardboard version of Amy and the Doctor. This is a freestanding cutout that you can place anywhere or if you want you can hang it flat on a wall. The cutout of Amy and the 11th Doctor is about 180cm tall just like the real hight of the Doctor and his companion. Having cardboard friends has the advantage that they are easy to stow away again and always available to hang out. So if you are planning a Doctor Who gathering or just need some friends then come get your Doctor Who Amy And The Doctor Cardboard Poster.